2. 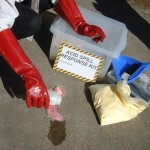 CONTAIN – Pour a bund of Acid Absorber/Neutraliser around the edges of the spill to contain and prevent it from spreading. 3. COVERAGE – Slowly pour the Absorber/Neutraliser from the outside of the spill inwards until completely covered. 4. NEUTRALISE –The colour change indicator in our ASAN Absorber/Neutraliser will change from yellow to red when it comes in contact with acid. As neutralisation continues, most particles will return to its former colour once the process is complete. 5. 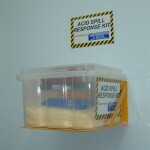 CLEANUP – When the neutralisation process is complete, the used absorber can be easily swept up using the dustpan and brush and placed into a disposal bag (all of which are provided in the kit) Dispose in the trade waste bin or in accordance with State and Federal Disposal Guidelines. 6. 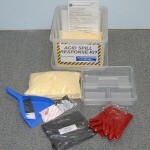 RE-ORDER – Contact your distributor to replenish any and all items provided in the kit.